Also known as a buckle fracture. This is a compression fracture of a long bone, typically in children. 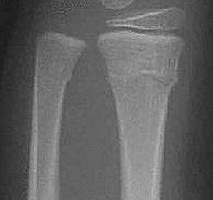 This type of fracture usually occurs near the metaphysis. Both cortical margins are affected, but a discreet fracture line or trabecular disruption is not present. Minimal buckling of the cortex is present. A AP radiograph of the forearm. The typical appearance of a torus fracture with buckling of the cortical surface.